Opal May Fugitt, age 74, of Greenville, passed away early Saturday morning, September 8, 2018 at Spectrum Health-Butterworth Hospital from injuries received in an automobile accident. 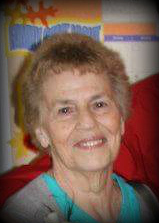 The daughter of Clarence & Linda "Elinor" (Sisson) Rohn, she was born on April 4, 1944 in Stanton. Opal retired from the former Electrolux Home Products after 38 years of service. On December 15, 1991, at the former Trinity Lutheran Church, she married Albert S. Fugitt. She enjoyed handicrafts, ceramics and painting, trips to the casino, and finding a bargain at the dollar store, but her greatest joy was in time spent with her family. In her youth she played women's softball and for many years she participated in league bowling. She was preceded in death by her parents; a son, Eric Medlar; a daughter, Kellie Fugitt; a sister, Lillian "Snooky" McKeown; and four brothers, Ivan, Marvin, Eldon, and Irvin. Surviving are her husband of almost 27 years, Al Fugitt of Greenville; her children, Rob & Sabrina Medlar of Gowen, Kirk & Lori Medlar of Greenville, Kimberly Sims of Muskegon, Sean & Sharon Fugitt of Greenville, John & Samantha Fugitt of Muskegon, Greg Fugitt of Ionia, and Jeff & Kristine Fugitt of Spring Lake; a sister, Jeanie Cavanaugh of Stanton; three brothers and five sisters-in-law, Stan & Esther Rohn, Reese & Patty Rohn, all of Stanton, Danny & Debbie Rohn of Belding, Janet Rohn, and Ruby Rohn, both of Stanton; twenty-six grandchildren; ten great grandchildren; and several nieces and nephews. Visitation with the family is from 5-8 p.m. on Wednesday at Christiansen Cremation & Funeral Care, 511 S. Franklin Street, Greenville, where memorial services will be held at 1:00 p.m. on Thursday with Mike Merren officiating. Envelopes for memorial contributions to the wishes of the family will be available at the funeral home.